Metal Clay is an exciting material developed and patented in the 1990s by Mitsubishi Materials of Japan. Microscopic particles of silver are mixed with a moist, organic binder to create a material that has the feel and working properties of modeling clay. Using simple tools, objects are easily given shape, texture, and character. After air-drying, the objects are heated to temperatures approaching the melting point of the metal, where the particles fuse together to make a dense, fully metallic object. Fired PMC work can be polished with a burnisher or in a tumbler, soldered, enameled and enjoyed like any other silver item. I love your name, but how do you pronounce it? I'm assuming you're referring to Signe. It's a family name from Sweden. It's been Americanized since it's original pronunciation, but I go with a short "i"; a hard "g" and a long "e" sound. It's two syllables and you can think of it like the first sound in the word "SIGma" + "KNEE". How is Metal Clay made? 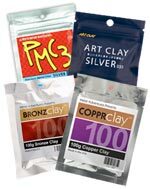 As soon as I learned about metal clay, also known as PMC or Art Clay, I was drawn to it. Its textural and sculpting capabilities seem limitless and the possibilities abundant. I became even more enamored, however, when I learned what differentiates it from mined silver. Most silver jewelry has traditionally been made from silver mined concurrently with other metals such as copper, zinc and gold. This silver, in addition to being used in jewelry and other silver pieces, is heavily used in the manufacture of electronic and photographic products. The mining of these metals involves enormously high energy consumption, a significant production of toxic materials, destruction of virginal land and frequently unconscionable labor practices. Fortunately, there’s an alternative way to obtain silver for crafting silver jewelry. This method extracts silver from discarded electronic and photographic components which probably would end up in landfills. Other less difficult to separate sources of recyclable silver are also added to the mix (e.g., dental fillings, scrap silver unable to be utilized by jewelers because they are too small or too contaminated, etc). The fine particles of this reclaimed silver are combined with an organic binder and water to create Metal Clay. I find it is relatively easy to work with, less prone to tarnish, high in silver purity and, best of all, it lets my imagination run wild! With the overwhelming volume of electronic products flooding our world today, it is so comforting to know that I can utilize reclaimed silver from them and remain true to my values. As jewelry designers, we can have our cake and eat it too. We can create beautiful jewelry while reducing waste and protecting our non-renewable earth. At the very least, let us try to not add to the problem. How much do you charge for custom jewelry? Price depends on several things, of course, whether or not a stone is added, the complexity of the piece, size, deadline, etc. But what else is new? When I receive your information through my, online form, I can send you a detailed estimate. For faster service, include information like a deadline to receive your jewelry by, preferred beads or stones and whether you are providing any materials. Your price includes design, consultation, metal, beads and stones, if any. Shipping charges and tax if applicable are added to the estimate when your order is complete. How do I get started with an order or get a quote? Just use my online form. My form will guide you through a few simple questions about your project so I can give you an estimate. How does this work? How can I have custom jewelry made online? Stage 1: Consultation- We begin with a conversation (by email) about your vision - the type of piece, precious metal, quantity, and design. If you are choosing one of my exisiting pieces, a firm quote can be provided at this time. For a custom piece, a rough quote would be provided at this stage with a final quote given once a prototype is created and a weight can be determined. Stage 2: Design - Once I have an understanding of your piece(s), I can begin the design stage. At this point a $125 non-refundable design fee is required which will be credited to the final price of your order. I will then work to create a detailed production drawing of your piece. You'll then review the drawing and work with me on any modification you'd like, until the design meets with your approval. At this point, I will provide you with a final price. Full payment is required to move to production. Stage 3: Production - Once you have signed off on the final design and payment has been received, we move to the production stage. Most pieces are cast using Two part silicone mold or a polymer clay mold process. I enlist many varying techniques to get my results. If you are ordering a quantity of pieces, I will create a prototype in polymer clay and mail it to you or send you a series of photos via email for approval (whichever you prefer) before producing the remainder of the pieces in the precious metal of your choosing. 1. The custom/modification process will typically take from two to four weeks for my existing pieces and three to six weeks for custom designs, all dependent upon the complexity of the design and the length of the modification and approval stage. 2. It's important to understand that a significant portion of the cost of creating custom jewelry is the time-intensive design and manufacturing costs that can only be spread across this single piece. Quite a contrast to a jewelry manufacturer who mass produces a piece and can spread the cost over the large quantity produced. So, while the precious metal chosen will also significantly impact cost, the simplest piece of custom jewelry in sterling silver will rarely cost less than $250. Pieces in gold, will obviously cost much more. 3. Another issue that can come up with custom jewelry is that of trademarked and copyrighted images and designs. Unless you own the rights to an image, design or logo, I cannot reproduce it on a piece of jewelry. As a creator of original designs myself, I am very supportive of an artist's or company's intellectual property rights. 4. I can create custom pieces in 99.9% fine silver. To find out more about the material I work with, check this out. 5. If you are sending the piece as a gift to someone else, I can email you with a picture of the finished project before I ship it to the recipient. Otherwise, you receive your piece of custom jewelry and hopefully you love it and enjoy it for many years to come! If you're ready to start a discussion, please complete the Custom Design Inquiry Request here. The more you can describe what you're looking for, the easier it is for us to make it happen. What if I see a piece that is sold but I really want it? Can I have something similar made? I am happy to re-create any of the designs you see on on my website or or my online shop. As each piece is made by hand, every one may not look exactly like the last but that is what makes them special and unique! I can also work with you to create new designs of your choosing. If you have a drawing or design in mind or you just have a few simple specs you need fulfilled and you want me to create something from my imagination, I am happy to work with you in either situation. Whether its a special moment with a loved one you're trying to create or you just want to treat yourself, allow me to make it the most memorable experience it can be. If you would like to get started on a commissioned work, please fill out this form. If you have a general question, you can also contact me here. If you haven't had your fingers gauged for your ring size lately, you can use my ring size chart to check your size. You will need a free application, like Acrobat Reader or a similar program, to open the pdf. One advantage of custom jewelry is you can make your jewelry to your size, even if that is a little different from readymade jewelry. If you think you are between sizes, we can make 1/4 size and 1/8 size increments. Just remember, it's easier to stretch your ring a little bit larger, than it is to reduce your size. How do I choose my necklace size? The most common necklace sizes are 16", 18" and 24". Choker size is 14 or 16" usually, depending on your neck size. One advantage of custom jewelry is you can make your jewelry to fit your measurements. To check your size at home, use a tape measure, or a piece of string and a ruler. Place the tape measure or string around your neck and adjust it until the end sits at at the desired level on your chest. Note the measurement on your measuring tape or mark your string and measure it on a ruler. How do I choose my bracelet size? The most common bracelet sizes are 7", 7.5" and 8". One advantage of custom jewelry is you can make your jewelry to fit your measurements. To check your size at home, use a tape measure, or a piece of string and a ruler. Place the tape measure or string around your wrist and adjust it until the end sits at at the desired level on your arm. A good fit for a bracelet should not be too tight, but not so loose that it falls past the point where your thumb begins, just past your wrist. Note the measurement on your measuring tape or mark your string and measure it on a ruler. For anyone like myself who has been told they need to or should wear a medical information bracelet for one reason or another, here is the perfect solution! A stylish bracelet that effectively sends the message to the Emergency Medical Staff trained to look for such things, yet allows you to have your very own heirloom quality piece of jewelry that you can be proud to wear. You can turn the emblem to the inside of your wrist to be discreet so that only the beads show, but if you do choose to show the emblem, it will surely get you a plethora of compliments for your good taste and originality. All Emblems are interchangeable. If you have a bead color preference you do not see here, I can definitely accommodate that. I can also make many types of silver beads. I am currently working on some Men's designs but I can definitely do them upon request. Don't hesitate to ask! I have consulted with local Emergency Medical Technicians and Doctors during the design process to get feedback on what type of bracelet would be most effective from their perspective. The key things that stuck with me from those conversations was that they mentioned that the lettering on the backs should be large enough to see and that their shouldn't be too much information crammed onto the small space. Only the very most important info should be on it so the EMT's can make those vital decisions even more quickly and accurately. If you are unconscious and the EMT is going to administer some aspirin or penicillin but you are deathly allergic, for example, that might be something you want to let people know about. What they told me is, they are going to go through your wallet or purse later anyway for more detailed information, so what they need from the bracelet is the truly vital stuff. In the case of those who get disoriented and perhaps tend to forget their identification when they leave the house, perhaps it would be good to have a name and a number to call on the bracelet in addition to the condition but generally this is not necessary. If you decide that you want more information, not less, that is not a problem. Just keep in mind that with every line added, the font size will decrease a little bit. Each of the symbols can hold approximately 0-25 characters (on its opposite side) comfortably and up to 75 characters a bit more compactly. The larger one may have a little more wiggle room. Please keep in mind that these suggestions are based on expert opinion only. I am not to be held responsible if someone does not see or recognize the bracelet in time when trying to assist you in an emergency situation. These are meant to be additional protection but not guarantees for your safety. They are very useful, but it is important to know their limitations. If you have questions regarding prices or general inquiries and have trouble accessing my online shop, please contact me here. If you would like to set up a custom order, please fill out this short form and I will send you an estimate and some follow up questions within 24-48 hours. How do I take Care of My Silver? It's how I choose to clean most of my jewelry most of the time. After each session under a polishing/buffing/texturing machine I always take a soft toothbrush with mild soap and warm water to clean out my components. I prefer sunlight. It get's the oil and dirt trapped in it exposing the piece's fresh bright surface. Rinse well after washing and be sure to dry the pieces thoroughly and dry immediately after washing. Pieces left to air dry may develop lovely little yellow water stains which are hard to get out. It happens. Your sterling silver jewelry will tarnish! If properly cared for, your sterling silver jewelry piece can be kept looking fantastic for forever! Well, not forever. Actually, maybe if you take good enough care of it! Ahhah! But seriously. The key to keeping your jewelry looking fine, is treating it fine. Keep it clean. In fact, cleaning it after wearing it is the best thing you can do. It's all the junk your skin leaves on the jewelry while it's sitting around waiting to be worn again that does the most damage. Like any kind of treatment, prevention is the best kind. So keep your jewelry clean kids! The polishing cloth is simply a cloth impregnated with a buffing compound which leaves a protective coating that prolongs the oxidation process. It is great for pieces with a high polish, and especially great for pieces with a patina that have been given a high polish. HOWEVER, I recommend cleaning the piece with soap and water first! It washes away the dirt and oil on the piece first, and that way dirt won't get trapped in the cloth and cause any unwanted scratches when you're shining up your piece! Safety first! If you would like me to add a polishing cloth with your purchased item (for a nominal fee), just let me know and I'd be happy to include one. The most standard patina I apply to sterling silver is Liver of Sulfur. I refer to this as "antiquing". The liver of sulfur oxidizes the silver, turning it dark. This is a permanent treatment. The piece is usually buffed after patination process to bring out the bright silver on the raised areas in the piece. I find this is an excellent method for creating contrast in my pieces and use it often. If your piece has been given a patina, it requires special care and should not be cleaned in a silver dip, as these dips can be extremely harsh and may - correction, WILL - strip this finish from the piece. I'm starting to get into brushed silver. I love polishing and most of my pieces are given a high polish under the polishing wheel. However some pieces final stages involve a steel brush or a satin finish buff. Polished silver is essentially burnished smooth, where brushed silver is a very fine texturing process. These two finishes require different care. Again, soap and warm water with a soft toothbrush. It cleans the oil and the dirt out of the piece and usually that is all you need to do. If you do this every time you finish wearing a piece it'll keep it looking great for a long time. Brushed silver doesn't really appreciate the polishing cloth treatment like high polished silver. The compound from the cloth will build up in brushed texture and make it look icky. Soap and water keeps that texture clean and bright. This is also safe for patinas. Silver dip will strip a patina off in an instant. So beware. The only time I would recommend using a silver dip is if you have a heavily tarnished simple high polished silver piece with no patinas or stones. Even then, only a moment in the dip, any longer might actually be more hurtful than helpful to your piece. You should try and take good care of all your jewelry, but especially if they contain stones or pearls! Pearls and porous stones such as turquoise can easily be damaged by chemicals in perfumes, skin lotion, and are softer so they are much more prone to abrasion then tougher stones. There are so many different and wonderful stones. Each of them is different. Some like jaspers for example are super tough. And others, such as labradorite are hard, but they contain cleavage planes which the stone may break along if given a hard enough knock. So if you have a special stone, find out about it so you can wear it properly and safely. For example, never wear your jewelry laying bricks. That's kind of an extreme though. A less extreme example would be to not wear your jewelry gardening. There is a lot of silica in dirt, and silica, which is basically quartz, will dull down your stones and silver if it's rubbing against them. This is super bad for any stones that are softer than quartz. Like amber for example. Digging around in the dirt with an amber ring will ruin it, guaranteed. Listen, stones are amazing. I don't want to seem like a downer, it's just that like anything else, they shouldn't be abused. Some people just aren't aware of what constitutes as stone abuse! I'm just trying to help your stones stay safe for you to enjoy for a long long time! How long does it take to make some custom jewelry? Usually it only takes two weeks or less to make your jewelry and deliver it to you. Delays can happen, especially if it takes longer than expected to reply to emails with reviews or approvals. A job can be slowed down as well if materials have to be ordered, or by seasonal delays due to too many jobs in the studio. Not a bad problem to have, but I like to get your jewelry to you as quickly as possible.All that being said, my official stance is what you see below, but it generally doesn't take that long. However, there have been times where it can, so it is always good to plan ahead. The custom/modification process will typically take from two to four weeks for my existing pieces and three to six weeks for custom designs, all dependent upon the complexity of the design and the length of the modification and approval stage. Can you make multiple copies of a custom jewelry design, for gifts or a business project? Sure thing. Just send me an email with the details of your project for an accurate estimate. Can you ship my order as a gift directly to the recipient? Absolutely. I can ship the jewelry as a gift and send any invoices and paperwork to you separately. Please specify when you order that you would like it as a gift. I want you to love and enjoy your jewelry for years to come. But if for some reason you aren't satisfied with your purchase, please contact me within 14 days of delivery to arrange for a return or an exchange. Shipping fees and custom order design fees are non-refundable. I stand by the quality of my workmanship. If any item you purchase from me should need fixing due to any defects or fault on my part, please contact me to arrange for a complimentary repair. Shipping charges will apply. What's your specialty? What are you good at? Please Browse my portfolio and judge for yourself. Is there any kind of jewelry you don't make? Sure. I don't work much with gem stones due to the ethical and moral dilemma I have with the trade practices that surround that market. That's not to say I have never owned any myself nor do I appreciate or love them, I am just opting not to go down that path for the purposes of this business venture. Most anything else if fair game. How can I trust that your jewelry is made of only fair trade and eco-friendly products? Well, to be perfectly fair, very few things are 100%, but I am striving every day to get to that point. I do use silicone and polymer molds, for example, but I will use them for many years to come so I feel I am putting them to good use. I use alternative, non-toxic ways to clean my silver. The term "non-toxic" can be very mis-leading and I have discovered that in reality something deemed "non-toxic" can, in fact, still be quite harmful; it just technically won't kill you. I am trying to be more cautious about what I use and how I use it since even labels are not always that clear. Everyone seems to have an agenda. At any rate, what I use definitely will not harm you or your drinking water. Just some salt, vinegar and maybe some citric acid. The silver findings and wire that I use are made of recycled silver as is the clay that I use to make my jewelry. When I do use beads, I opt for glass from the Czech Republic as they seem the least controversial and semi-precious cabochons from reputable, fair trade gem dealers. The boxes and all my packaging materials are also made from 100% post consumer recycled content. Certainly. Email me to arrange an appointment. If you happen to be in my area, don’t hesitate to stop by. My studio is in Philadelphia, PA. Directions are available upon request. Fushigi Slump Heavy Industries: Many thanks for all your help and expertise!